The Twin Otter was deployed for a mission during Operation Nanook-Nunalivut on March 11 when it struck a snowdrift and damaged its nose. 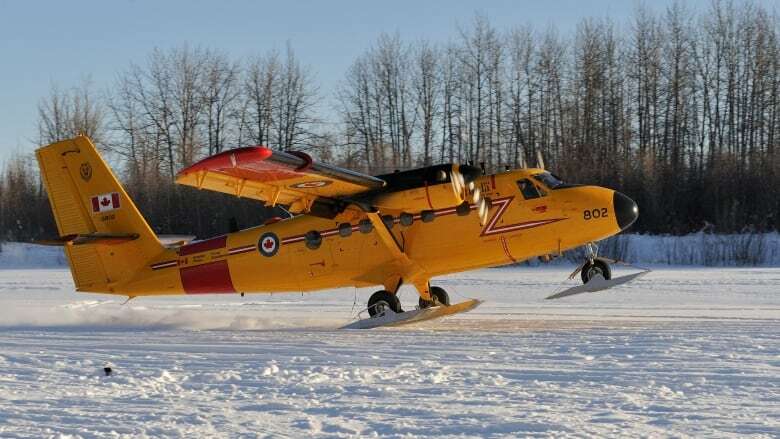 The Royal Canadian Air Force is working to extract a Twin Otter aircraft that damaged its nose during a landing earlier this month near Inuvik. On March 11, the CC-138 was coming in for a normal landing on sea ice 140 kilometres north of Inuvik when it struck a snowdrift. The plane was deployed on a mission for Operation Nanook-Nunalivut, one of the military's yearly exercises in the Arctic. "They obviously didn't see a snowdrift that was too big ... which did some significant damage to the nose gear," said Maj. Andrew Oakes, the air task force commander for operation recovery for the RCAF. "And so the aircraft was obviously not flyable off of the ice." The four people on board weren't injured, Oakes said. "There wasn't even any scrapes or bumps. In fact the crew and the passengers said that it was very benign," he said. A private helicopter was deployed by search and rescue to the area — the Canadian Armed Forces also sent another of its Twin Otters to the scene. Oakes said from the time of the landing, to the crew and passengers getting to Inuvik, was about four hours. Now, the challenge is to get the damaged aircraft home. A heavy lift helicopter needs to be contracted, and they need a berm before the helicopter can come in and sling (or pick up) the aircraft off the ice and get it back to Inuvik. It's not the first time one of the RCAF's aircraft has been in this position. A similar incident happened in 2012 in which a CC-138 Twin Otter was damaged. "What I'm told is something very similar happened," Oakes said. "It was a summer exercise though — they were landing on the tundra and a similar type of damage occurred to the aircraft where the nose was damaged and was unable to fly itself off." Oakes said the warm weather in the region has been helping the technicians, and he hopes that preparations to move the aircraft will be complete by Thursday.